SRmoto.com carries many WR250R parts, including skid plates and radiator guards from Flatland Racing, footpegs and cargo racks from Pro Moto Billet, tail light kits and turns signals from DRC, skid plates from Zeta Racing, lowering links from Yamalink, step seats from Spiral, gas tanks from IMS, and more. 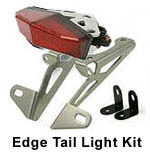 All products will fit the 2008+ Yamaha WR250R (and WR250X). Easily our best selling rack for the WR250R, the Pro Moto Billet WR250R Cargo Rack is CNC machined from a 1/2 inch thick plate of 6061 billet aluminum, and is then “hard black” anodized for durability, ease of maintenance, and protection from the elements. Stainless steel fasteners provide carefree maintenance. The rack is a must if you want to carry anything on the back of your WRR. Oh, and this rack is made right here in the good ole USA. Get yours from SRmoto. The WR250R is a pretty tall bike, so if you are slightly height-challenged like myself, the Yamalink Lowering Link is a must-have mod. Combined with the factory lowering option, it will help lower the seat height by approximately two (2) inches. After doing this mod to our WR250R project bike, I'm much more comfortable on the bike both on the street and in those nasty off-road situations. Get yours from SRmoto. The FMF Q4 Slip-On Muffler is the most popular slip-on muffler for the WR250R. You can combine it with the FMF Powerbomb Header and FMF EFI Programmer to maximize performance and improve the sound of your bike. Also available are a few FMF Performance Packages (Package #1 and Package #2) that combine each of the FMF products. On a bike like the WR250R, the radiator is pretty vulnerable to damage in the event of a crash. In stock form, the only thing protecting it is the plastic tank shroud and a flimsy black plastic guard. 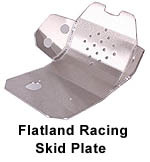 Flatland Racing's radiator guard is constructed from 1/8" aluminum and completely surrounds the radiator, helping shield it from front and side impacts. Get yours from SRmoto. If you're looking to get rid of the narrow stock footpegs on your WR250R, look no further than the F5 Footpegs from Pro Moto Billet Fastway. Not only does the wider platform offer better grip, but the footpegs incorporate a patent pending Universal Collar System that allows you to choose from standard or lowboy seat-to-peg height positions. In addition to that, the FKMS (Fast Kamber Mounting System) allows you to adjust the upward and downward tilt of the pegs using a bolt and shims on the backside of the peg. I've been using these footpegs for a few months now and they are a huge improvement over the stock pegs. Get yours at SRmoto. Probably the most popular rear tire for the WR250R is the Dunlop D606 in a size 120/90-18, which Dunlop designed to be street-legal tire with an emphasis on aggressive off-road riding. It features a full-depth tread pattern designed for rigorous off-road use that yields excellent traction on everything from hard-packed fire roads to soft single-track trails. At the same time, the D606's tread compound is engineered for good highway durability and grip. The 2008+ WR250R uses a size 120/90-18. Get yours at Revzilla. Probably the most popular front tire for the WR250R is the Pirelli MT-21 Rallycross in a size 90/90-21. Pirelli bills this as a 90% off-road / 10% on-road design, so if that is your type of riding, they will work great and last 4000-5000 miles. 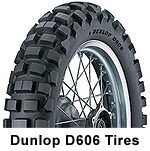 If you do most of your riding on the street, you might want to consider a Dunlop D606 Front Tire in size 90/90-21. They seem to work better on the street, providing a little better grip and lasting a bit longer.